Pierson is about a year old. For a dog his size, that means he is still a puppy. And a puppy means chewing. In my experience, dogs tend to love to chew for the first two years of their lives. Pierson has been no exception. Here are some tips to keep your dog from chewing that I am also using for Pierson. The thing that best helped to keep my other dog Maya from chewing was crate training. Maya did very well in a crate so it was easy to teach her which things were hers to chew on. And crate training was an easy way to prevent her from chewing on things when we were not home. But crate training is not always easy, as we have found with Pierson. So if your dog hasn’t gotten used to his crate yet, there are still other things you can do to keep your dog from chewing. Putting things away out of your dog’s reach is a great way to keep your dog from chewing them. Put your shoes in the closet and close the closet door. Make sure small chewable things like toys or remote controls are put up. Put away his dog bowls when he is done eating. If your dog can’t get to these things, he can’t chew them. If your dog still manages to find something he is not supposed to chew on, take it away and say ‘no’ in a firm voice. Then give him a toy he can chew on. Whenever he chews on his own dog toys, tell him he is a good dog. Give him praise or even a treat. When your dog is in his crate, only give him indestructible dog toys to chew. But when he is out of his crate and you are able to keep an eye on him, give him lots of dog toys to choose from. Pierson has fleecy dog toys, Kong dog toys, other hard dog toys, a Tuffy’s dog toy, and a hard unbleached beef shin bone purchased from the pet store. We don’t recommend rawhides because if your dog tears off and swallows a big chunk, it can get lodged in his stomach causing great pain and even death. Be careful with any dog toy you give your dog. Make sure pieces cannot be torn off and swallowed. Watch him as best you can. I have to admit that using a squirt bottle or loud noise to keep your dog from chewing is not a method I have used. I haven’t needed to. But this is what I have heard about how it works. When your dog chews on something he is not supposed to, squirt him with water or shake a can full of coins to make a loud noise. To keep your dog from chewing things like furniture legs, pillows, plants, or other things which are not easy for you to keep out of his reach, try spraying these things with Bitter Apple spray deterrent or another spray chew deterrent. Bitter Apple and other chew deterrent brands can be purchased online or at a pet store. But if you have peppermint extract or cayenne pepper, you can make your own spray chew deterrent. Peppermint might be best for things you and your family touch regularly. Having a young dog can be a lot of work. By being diligent, consistent, and patient, your young dog will grow up and out of these bad habits. My older dog Maya knows exactly which toys are hers (although she does get stuffed animals confused with her plush dog toys). If Maya can learn, your dog can too. You can keep your dog from chewing his way through your personal things. 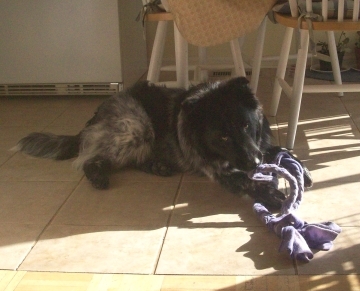 This entry was posted on January 17, 2012 at 7:30 am and is filed under Dog Leisure, Dog Training Tips. You can follow any responses to this entry through the RSS 2.0 feed. You can leave a response, or trackback from your own site. Just after I published this article, I discovered that Pierson had gone into the living room, took a library book off the table, and chewed it to pieces! He did it during the night. I am working on him being crate trained, but he has not been as easy to crate train as Maya was. Crate training would have prevented this recent bit of destruction.